1. Olive Garden serves HUGE portions and loooooves to use TONS of sauces and oil on EVERYTHING. Beware! 2. You can swap any pasta dish out with whole wheat linguine, which, though similar in calories, is a healthier option. 3. Swap out any high cal sauces (I.e. creamy or oily) for marinara sauce - just ask! 4. If you get one of the "create your own pizzas", they'll make it with "thinner" crust for you, if you ask. This is a great option b/c you can ask for it cheeseless and with healthy toppings, too! 5. If you're looking to save money, your best option is to get the "Soup, Salad & Breadsticks" meal. It's just $6.95 (but it's only offered until 4pm everyday). 6. Olive Garden employees are very helpful and will honor any/most special order requests. 7. You can order almost anything and split it (we did this with the grilled chicken Caesar salad). They'll even bring it out on two plates for you. This is a great option, because all their entrees are huge. 8. You probably should ignore the dessert and drink menu at Olive Garden - there's nothing healthy on it! 9. If you have trouble controlling yourself around delicious bread, you may want to ask them NOT to bring out the "endless portion" breadsticks. Yikes! 10. The items on their "Garden Fare" menu are not necessarily diet-friendly, so don't assume they are! This fresh vegetable, bean and pasta-packed soup ROCKS! It consists of chunky pieces of zucchini, garbanzo beans, white kidney beans, sugar snap peas, tomatoes and mini shell pasta, all in a light tomato broth. It's soooooo good and very fresh tasting. We love it. This soup is a MUST, and likely the only calorie-friendly soup on their menu. The pizza at Olive Garden is YUMMY! And, believe it or not, there are ways to make it diet-friendly. For starters, order yours with a VERY THIN crust and they'll make it that way for you. We opted to get ours cheeseless, with onions, mushrooms and tomatoes. It's pretty big, too, so we recommend splitting this item with a pal! Again, there's no nutritional info available for the pizza, but with a very thin crust, no cheese, and some veggies, we'd guess the whole thing would have about 600-700 calories or so. Split one and pair it with a cup of the minestrone soup, and you'll have yourself a GREAT meal! This salad can be your best friend, or a total nightmare. The safest way to order it is with the dressing on the side. If you want to save even more calories, ditch the croutons. 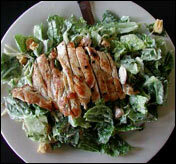 The (very flavorful) grilled chicken, with freshly shaved parmesan, served over fresh, crispy romaine was awesome! The portions were HUGE. A regular portion of the dressing, will probably add 300 - 400 or more calories and dozens of grams of fat to your meal. We say ditch the dressing altogether, or bring your own. Though they don't make their nutrtional info public, we would guess that the salad without dressing and croutons, clocks in at around 375 -400 calories. If you decide to go for the dressing on the side and dip very sparingly, you can probably manage to take in just another 100. But be careful! Since the "Garden Fare" menu didn't impress us all that much, we ordered this thinking it would be relatively healthy. After all, it's skewers of grilled marinated steak and chicken, served with grilled vegetables and Tuscan potatoes, so how bad could it be? Well, the Mixed Grill came with all of the above (BTW the "grilled veggies" were zucchini, red and green bell peppers and onion). Unfortunately the meal arrived with TONS of oily sauce that didn't even taste good. And the potatoes were DRIPPING in oil, too! The meat was salty, and since we didn't really like the flavor of the sauce, it was hard to tell if we liked the meat. If you want to get this meal, we say order it DRY, ask for the sauce on the side, and get MORE veggies in place of the potatoes. If you order it sauce-free and without potatoes, we would guess this entree would clock in at around 600 - 700 calories or so. Order it "as is" and we'd guess it contains more like 1,200 - 1,400. This Garden Fare menu item contains fresh vegetables and chicken tossed with farfalle pasta in a lemon-herb sauce. We swapped out the farfalle pasta with the whole wheat linguine, but we didn't really enjoy the lemon-herb sauce (it was too sour), and would actually ask for marinara next time. It did come with some good, yummy veggies - broccoli, zucchini, red pepper, sliced carrots, and green beans, but the chicken was saucy and salty. With a few changes, this dish could be an ok choice, but the portion was so large we had a hard time believing it was only 408 calories. This, like most of Olive Garden's entrees, might be better for sharing. December 9th is National Apple Pie Day. Instead of a pie, why not enjoy a baked apple with some lowfat ice cream? Share this Olive Garden news with everyone you know...Click "send to a friend" NOW!